Lewis Hamilton didn't see this coming. 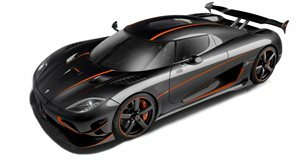 Formula 1 World Champion Lewis Hamilton was recently filmed picking up and driving an incredibly rare Koenigsegg Agera HH in the final leg of the 2015 Gumball 3000 Rally to Las Vegas, Nevada. Before taking the car on the road Lewis was given a brief overview of the Swedish hypercar. Given the fact the Mr. Hamilton is a two-time F1 champion, the overview of the car almost seemed to be completely unnecessary. The guy obviously knows a thing or two about cars. However, it seems as if no one deemed it necessary to brief Lewis on when to refill the hypercar with fuel. The result? The poor Agera ran out of gas after only four hours in, of all places, the middle of Death Valley in the Nevada desert.